I’ve been using Sealskinz for about a year now. I originally bought them for trail running in wet conditions as my shoes are not waterproof and I wanted dry feet. I then realized they were far more useful than I expected. First, like any waterproof breathable material, this will make your feet sweat. So you need to find a way to handle that moisture. I liberally apply foot powder to my feet, and then wear a very thin liner sock. I find that this keeps my feet comfortable. At longer rest breaks, I will take off my shoes or boots, remove the Sealskinz and turn them inside out to dry, and reapply foot powder to my feet. Now, they work great for trail running on muddy trails. They keep the dirt and water away from my feet, and prevent the abrasions and blisters that result. I don’t need waterproof gaiters, instead, a simple and breathable gaiter is sufficient to keep debris out of my shoes. One thing to keep in mind, though, is the thickness of the Sealskinz and liner sock combination. If you want to size your shoes for this, I suggest also finding normal running socks that are just as thick for the times you don’t want to use the Sealskinz. I also carry them on backpacking/trekking and climbing trips that involve a lot of stream and river crossings. I will wear the Sealskinz in my normal boots and cross streams and rivers without stopping. 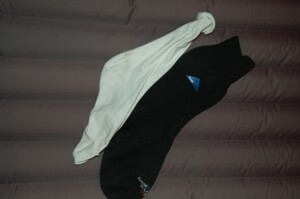 I’ll dry my boots at night, and it keeps my heavy insulating socks nice and dry for the actual climb or cold conditions. I have not had any blisters while using the Sealskinz in this manner. Copyright © 2019 Chris Echterling All rights reserved. Amazing Grace theme by Vladimir Prelovac.